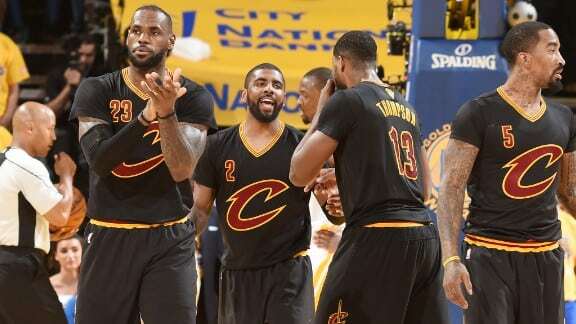 If you had to put a finger on it, the day Uncle Drew became the man was Game 7 of the NBA finals when he drained that step-back three in the face of NBA MVP Steph Curry to give Cleveland a 92-89 lead and seal the deal on LeBron James’ immortality coronation. Or maybe it was earlier, in Game 5 when he scored 41 to stave off elimination. In retrospect, the impact of that game was probably his finest moment, but the improbability of a historic Cleveland comeback lessened the magnitude of the moment at the time. Most saw it as a tease because the mountain to an NBA championship seemed insurmountable. We now understand that it was part of Kyrie Irving’s remarkable destiny and affirmation that he was finally on equal ground with LBJ, if not in supreme baller stature but importance to the Cavs’ championship mix. The continuation of Irving’s “it” moment was on display on Tuesday night as he scored a season and team-high 32 points in a thrilling 128-120 shootout win over The Beard and Houston. They say after you get over the championship hump the first time, it gets harder to repeat and bring the same passion and purpose the following season. On the other hand, if you can retain your best players and add some new guys who actually make you better, then rolling through the regular season is usually a piece of cake because championship squads are usually fine-tuned machines. Add in the plethora of opposing teams who aren’t in sync yet because they have dramatically altered rosters, and Cleveland’s 4-0 start, along with Irving’s MVP caliber play, and a Cavs repeat is no long shot. Irving’s ascension to NBA superstar and electric pill pusher is officially complete. He’s no longer the young, freakishly talented court killer for a bum squad with no hopes, as he was when he first entered the league. He’s the No. 1 offensive option on a championship team featuring LeBron James, who in Irving, has finally found the player who will allow LBJ to be the Magic Johnson model he wants to be. Everybody's on their Biz Markie with Irving these days, talking about, "Can I borrow a dollar, ooh you're a star now." 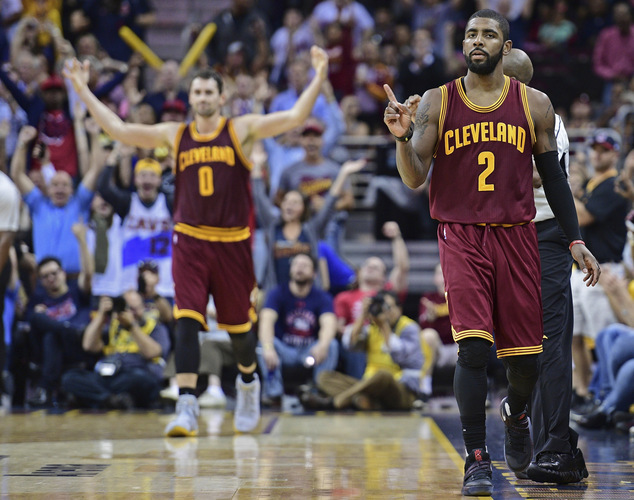 Those who said his new-school mentality wouldn't mesh with a team concept are catching the vapors, and Irving has helped turn Cleveland into a hoops hurricane. He leads the Cavs with a career-high 26.8 points per game, which is good for 8th-best in the NBA. Sure, the NBA has a ton of guards who can light it up, but of the seven scorers averaging more points than Irving, only Kawhi Leonard has a ring. Also, some of these “other” guards have peaked already. This season, Irving is establishing career highs in field goal percentage (.476) and he’s draining threes at almost a 54 percent clip, which is over 100 points higher than in his previous five seasons. Let's hope he stays healthy enough to play his first full 82-game season this year as well. To watch him blossom and rush the bucket, make moves like Michael Jackson while moonwalking on a basketball court and becoming a stone cold sniper in crunch time, while other “bigger” names wilted to the pressure and the magnificent intimidation of the moment, has been a pleasure. Irving had to travel a long way in a short amount of time, once LeBron touched ground at home. He had to bag his ego, turn up his work ethic, humble himself and truly become dedicated to a system that, for the first time in his career, didn’t feature him. After a year and a half of struggling to see where his all-world skills and confidence fit in with LeBron’s dominant presence, it is obvious that Irving’s talent is on 100 right now. He has totally figured out how to maneuver and benefit from the unselfishness and overall incomparable basketball acumen of King James. Last year, the major NBA story line was Golden State’s 73 wins and whether or not LBJ could deliver on the optimism that return home inspired. This season, an engaging story will be the rise of Kyrie Irving. With nothing to prove but how many rings he can win before LeBron hangs them up and a green light to assert himself as the most destructive offensive force on the court whenever he sees fit, Kyrie has now officially stepped to center stage. His quest for back-to-back chips and his first Finals MVP Award will be the driving force behind what is sure to be some mega-monster hardwood hooping this year. This post was originally published on The Shadow League. Sign up for Blavity's daily newsletter!